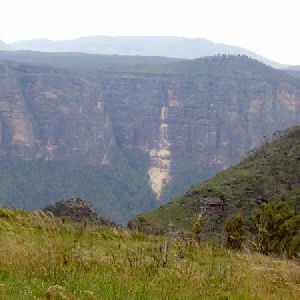 From the car park, this walk heads past the gap in the train track-style fencing, passing a sign for ‘Butterbox Canyon’. The track traverses the saddle to rise up onto a flat area, continuing for approximately 20m to an intersection with a track to the left. 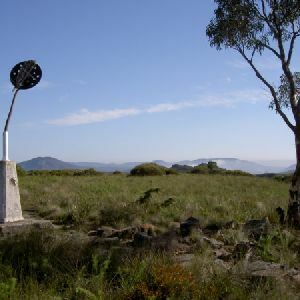 Veer right: From the intersection, this walk heads approximately 20m up the hill, keeping the rocky knoll to the left of the track, soon coming to the intersection. 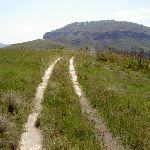 Veer right: From the intersection, this walk follows the overgrown management trail up the hill, keeping the rocky outcrops on the hill to the left and the large hill, Mt Hay, directly ahead of the track. The track heads down to an unsigned intersection. 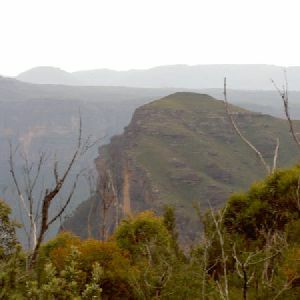 Continue straight: From the intersection, this walk heads down the management trail towards Mt Hay, with the Grose valley some distance off to the left. 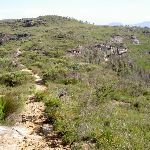 The trail tends right for approximately 50m to a rocky surface, where the track rounds a rock outcrop on the right-hand side. 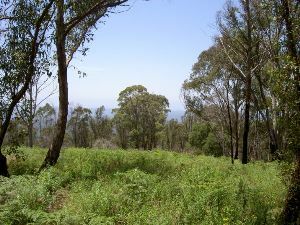 The trail slowly winds down the hill and across a saddle protected by trees. 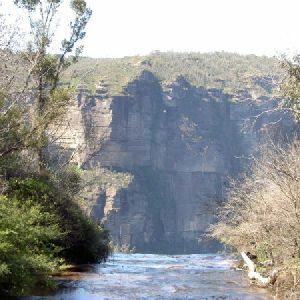 The walk then turns into a single track up the hill leading to Mt Hay. 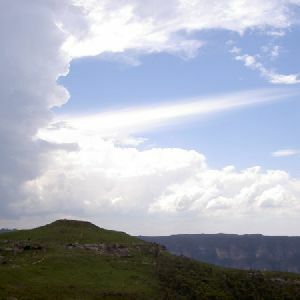 The track heads up to a small knoll and continues to an informal lookout marked by a prominent rock feature on the left. 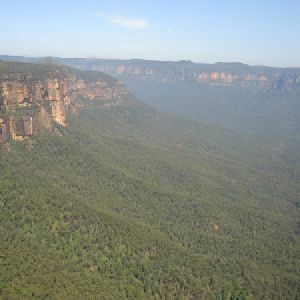 Continue straight: From the ribbed rock feature lookout, this walk heads around a rocky outcrop to lead up the hill, keeping the Grose valley some distance off to the left. 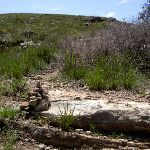 The walk leads up the hill through the trees to climb two small rock surfaces – These are marked by small cairns. 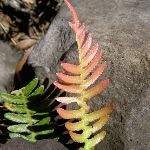 The track continues up the hill, passing a rock landing on the left covered by moss. The walk heads up through a grassy area where the track becomes undefined. 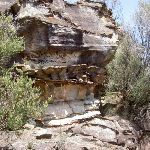 The walk continues for approximately 100m up the hill to an area of soccer ball-sized rocks and grass. 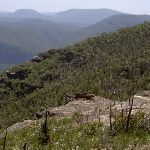 The track leads up past a knoll made by these rocks (the knoll is to the right of the track), coming to the large cairn on the summit. 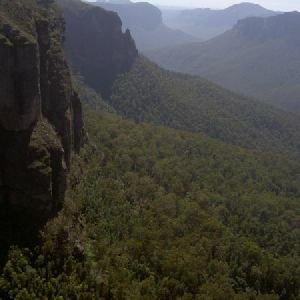 Mt Hay, Blue Mountains National Park, is a large basalt-capped mountain, which creates a more fertile environment for different plant species. 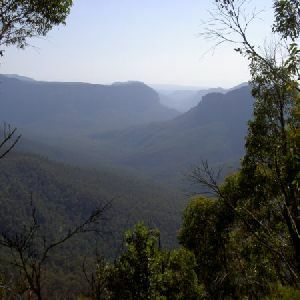 The mountain is accessed by Mt Hay Rd, with a defined bush track which leads to the top. 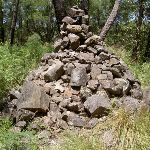 At the top of Mt Hay, there is a large cairn, made from basalt bricks from the surrounding prominent knoll, which is the highest point. 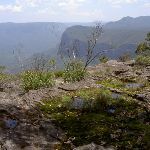 Excellent views are gained into the Grose Valley, from the track up Mt Hay, however the summit itself does not have views, blocked by the tree canopy. 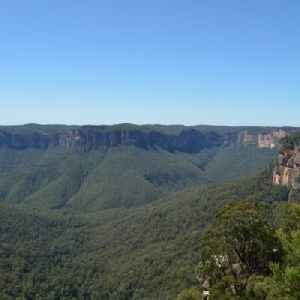 Around 1.1km of this walk has short steep hills, whilst the remaining 430m is very steep. 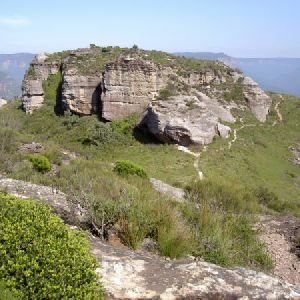 Around 1.2km of this walk follows a rough track, where fallen trees and other obstacles are likely, whilst the remaining 330m follows a formed track, with some branches and other obstacles. Around 1.2km of this walk has minimal directional signs, whilst the remaining 330m has directional signs at most intersection. 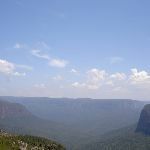 Around 1.2km of this walk requires some bushwalking experience, whilst the remaining 330m requires no previous bushwalking experience. 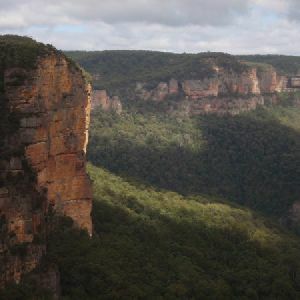 Around 1.2km of this walk has limited facilities (such as cliffs not fenced, significant creeks not bridged), whilst the remaining 330m has limited facilities (such as not all cliffs fenced). 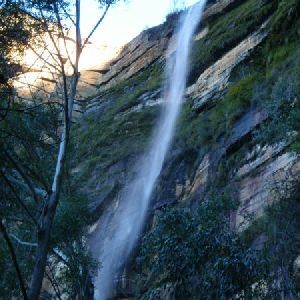 A list of walks that share part of the track with the Mt Hay walk. 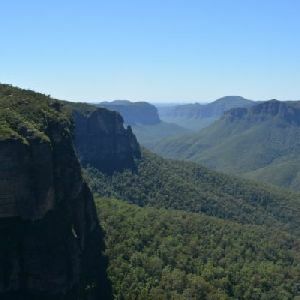 A list of walks that start near the Mt Hay walk. 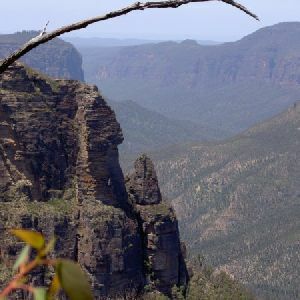 http://new.wildwalks.com/wildwalks_custom/includes/walk_fire_danger.php?walkid=nsw-bmnp-mh Each park may have its own fire ban, this rating is only valid for today and is based on information from the RFS Please check the RFS Website for more information.